A centerpiece of the Integrating Agriculture in National Adaptation Plans Programme (NAP-Ag) in Thailand is its support to develop a new five-year Strategy on Climate Change in Agriculture (2017-2021). This is spearheaded by the Ministry of Agriculture and Cooperatives (MOAC) and its Office of Agriculture Economics (OAE). 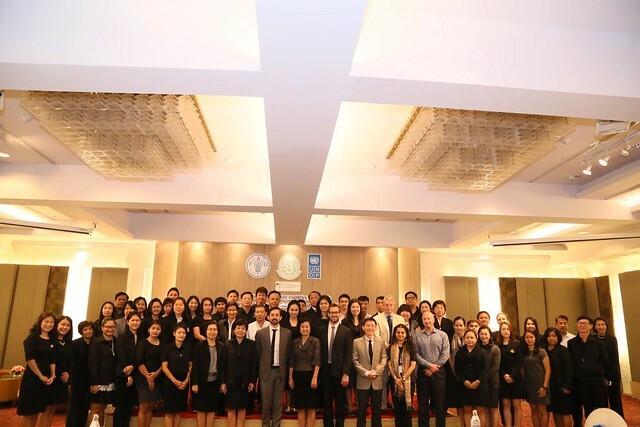 The strategy was unveiled after a series of meetings by a Technical Working Group at a three-day workshop held on 23-25 November 2016 in Bangkok, organized by UNDP. Over 60 participants from each MOAC line department and 10 participants from academia and civil society were briefed by the Office of the Natural Resources and Environmental Policy and Planning (ONEP) and GIZ on the status of the National Adaption Plan (NAP) and learned how NAP-Ag programme efforts could support a broader NAP process and align with the Sector Plan. The new strategy focuses on improving evidence and data for informing policy choices, building the capacity of farmers and agri-businesses to adapt, promoting low-carbon development and productivity growth in the sector, and building institutional and managerial capacities to cope with climate change impacts. High-level policy discussions between MOAC, UNDP and FAO representatives on how the new sector climate strategy could catalyze more risk-informed plans, and institutional caps identified through baseline studies on budgeting and programming planning, were followed by a technical training workshop. This workshopfocused on building skills to design and appraise projects to improve their feasibility and justification to the Bureau of the Budget. Post-conference surveys revealed that most participants learned a lot about Cost–Benefit Analysis (CBA) and climate change adaptation, and they thought these skills would be highly relevant to their daily work. They underscored an appreciation for knowledge about the eight steps to conduct a CBA analysis and how various methodologies for adaptation planning could be applied to program and project feasibility. Participants showed interest in extended learning on these topics through more hands-on training and case studies on agriculture. Somsak Topool (Fishery Department): This CBA workshop is very useful for decision making for budget allocation purpose. The workshop was conducted in a stepwise manner and I am interested to have more advanced training on this subject. Pongsakorn Tangsiamwanit (Royal Irrigation Department): This workshop enhanced my existing knowledge of CBA already used for project appraisal at RID. I’ve refreshed the CBA knowledge and have clearer understanding of the concept and application. Supakunya Kanchanakuha (Office of Agricultural Economics): The workshop is certainly useful for the prioritization of programmes and projects under the MoAC climate change strategy. It will be useful if a more advanced training is undertaken to shed more light on both direct and indirect benefits.